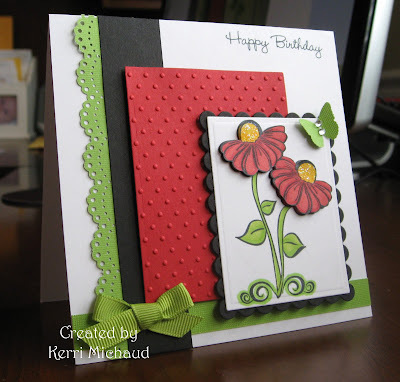 This is absolutely gorgeous, Kerri!! Have a fun night out!! Gorgeous, Kerri!!! Love the colors and your beautiful flowers!!! Lovely card!!! Kerri this is BEAUTIFUL!! WOW I love your colors....and your take on this sketch is FAB!!! Cute flowers, beautiful card. I love the colors, wonderful job. Enjoy your mom's night out! I love these colors together...was working on something similar last night but trashed it. Love your lil' flowers popped up and then with the shimmery centers. Hope you had a fab night out! Absolutely fabulous Kerri! Those colors are awesome together...love that border-edge, the dot embossing, the dimensional flowers and that butterfly really makes it all pop! Very beautiful card! Love the dimension you created with the flowers! Thank you for visiting my blog Kerri... It means a lot to me! Great color combo. I like how you popped up the flowers and butterfly.